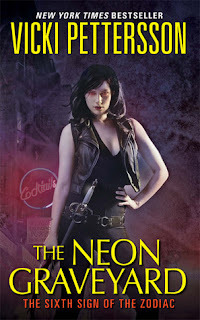 The Neon Graveyard is the sixth and final book in the Signs of the Zodiac series by Vicki Pettersson. This is definitely not a standalone book. In fact, I did not read City of Souls (Book #4) which was pivotal in the change of Joanna from Light Archer to mortal, and the previous book, Cheat the Grave, took some time to get into because of that. However, like its predecesor, Neon Graveyard moves at a quick pace and you have to hold on tight to the pages to try to keep up with the story. Joanna is hiding out with the rogue "grey" agents, who have been cast out of Light or Shadow troops for varied reasons. They are committed to destroying the Tupla and gaining access to Midheaven before its demon goddess, Solange, finds a way back to this plane of existence. Joanna's reasons are even more personal; her lover - and father of her unborn child - Hunter is trapped in Midheaven by Solange, who is in fact Hunter's ex. Add to this the fact that Joanna has been in a"kill or be killed" battle with the Tupla, her father, that has carried over the last five books. Throw in the final burden of Warren, Joanna's former leader in the Light troop, who's mechanations and need for ultimate control and power has dissembled his troop from within, Joanna has a lot to deal with in this book. And she does, fast and furiously. Pettersson's world building has been amazing throughout the series, and she pulled no punches with destroying and recreating the character of Joanna Archer throughout them. Joanna's loss of her powers, and her status as the Archer, was a turning point and you could see a shift in the storyline because of that. What really drew me into the first three books was the cat and mouse play between Joanna and the Tupla, and I was left a little dissatisfied with how the story of those two reached its final moment. It seemed to shift from a primary to a secondary plot, and not given quite enough space in the entirety of the book. One of my favorite parts throughout the books has been Master Comics and the Changelings. I have always loved the idea of a necessary neutral zone, which the store provided, besides being a place that holds the knowledge of the Shadow and Light (in comic books!). I will miss the juvenile antics that occurred there, with both the Changeling children and their Zodiac agents. Neon Graveyard gives the store its due, and fans of the series may be surprised with how some of it plays out here. The Neon Graveyard is an action-packed finale for the Signs of the Zodiac series. Pettersson does not disappoint the fans of Joanna Archer and brings her full circle to everyone's satisfaction.